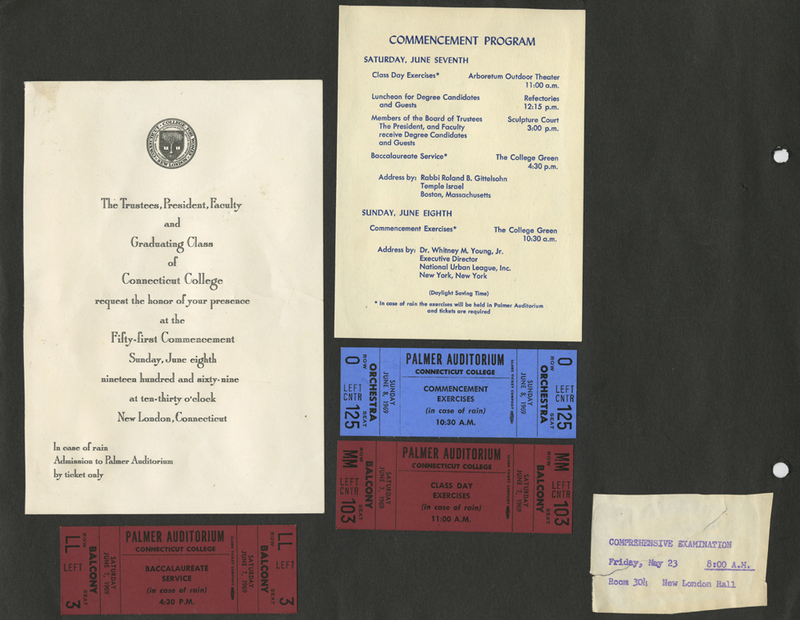 Page 2 contains ephemera related to the Fifty-First Commencement Ceremonies of Connecticut College. 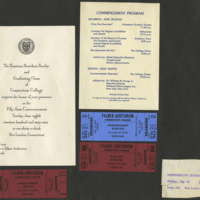 This includes: An invitation to the Fifty-First Commencement Ceremony; a commencement program outlining the commencement events on June 7th and 8th 1969; a ticket for the Baccalaureate Services held on June 7, 1969; a ticket to the Class Day Exercises held on June 7, 1969; and a ticket to the Commencement Exercises held on June 8, 1969. A small stub indicating the day and location of Linda's comprehensive examination is also attached to this page. Abel, Linda Lee, “Linda Lee Abel Scrapbook Page 2,” Linda Lear Center Digital Collections and Exhibitions, accessed April 24, 2019, http://lc-digital.conncoll.edu/items/show/1077.